U of T claims that only two students were sexually assaulted at the St. George campus in 2013. Does that make any sense to you? It shouldn’t. Consider this: the United States Department of Justice found that twenty per cent of female university students were sexually assaulted at least once while completing a four-year degree. According to Statistics Canada, 51 per cent of Canadian women have been sexually assaulted at some point in their lives, and those assaults are more likely to happen to young women at university. So does it make any sense that only two students were sexually assaulted at St. George out of a total of 51,203? Maybe U of T is singularly capable when it comes to protecting its students — or maybe U of T is hoping the problem will go away by simply pretending that it doesn’t exist. Last March, U of T students were assaulted between the Ontario Institute for Studies in Education (OISE) and the St. George subway station. 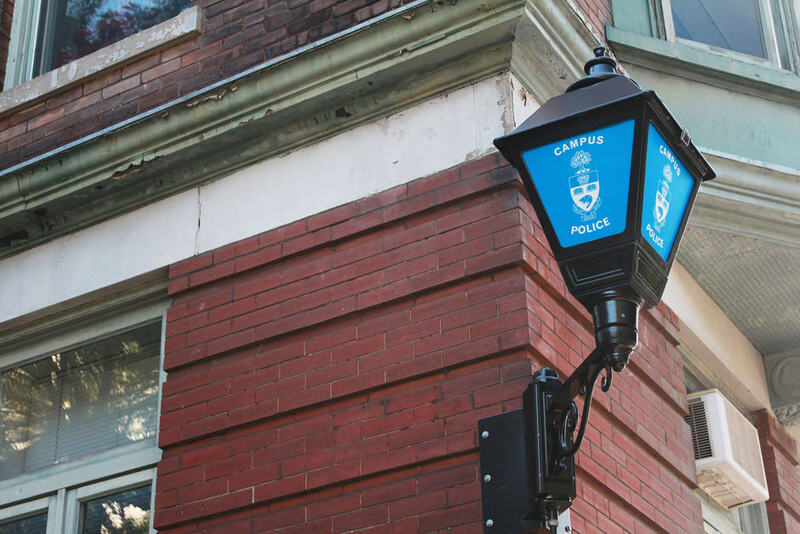 One student, who requested that campus police investigate the incident, or at least occasionally patrol the area at night, was told that being a few feet away from OISE — and thus technically off campus — meant there was nothing campus police could do. Just last week, we were reminded of campus police’s tragic ineffectiveness when a U of T professor was stabbed in his office — despite having reported his stalker to campus police. When it comes to sexual assault though, it’s not just campus police who are failing to protect students. U of T administration hasn’t updated their sexual harassment policy since 1997, and it only applies if the assault happened on campus or the student was engaged in a university-related activity. The story of James Andrew Payne — who taught at the Faculty of Architecture for over a year after being arrested for sexual assault before the university became aware and began investigating — illustrates that the university is, to put it mildly, not exactly on top of things. There is a better way. The United States has finally realized that sexual assault is a massive problem on university campuses for many reasons, but the fact that we don’t talk about it makes it more likely to happen. Over the past several months the US government has crafted a star-studded publicity campaign led by Daniel Craig, Benicio Del Toro, and Barack Obama to encourage dialogue on the issue. Our culture of silence breeds a culture of complicity. Don’t believe me? Consider the fact that 60 per cent of men in university said they would commit sexual assault if they were certain they wouldn’t get caught. If that’s not something we need to talk about as a university, I don’t know what is. There are common sense reforms that U of T could implement: we only have to look to what the United States is in the middle of mandating for all post-secondary institutions. We could institute surveys to gauge how many students are actually sexually assaulted; after all, self-reporting is notoriously ineffective. We could establish a victim’s advocate that keeps information confidential and helps students navigate the labyrinthine systems of support that do exist at the university. Perhaps most importantly, we should not only talk about how potential victims can protect themselves, but also about how bystanders can make a difference — and hammer home what should happen to perpetrators. Working at The Varsity last year, I interviewed five students who were sexually assaulted while attending U of T. They all tried to go to campus police, or Counselling and Psychological Services (CAPS), or some other university agency. They were all met with that toxic combination of indifference and incompetence that so many U of T students have faced. We never ended up running a story, but their stories stuck with me. Most of those students had some personal connection to the paper — they made me wonder how many students who don’t know someone at the paper are out there. So, to return to the original question: does the number two make any sense? Of course it doesn’t. The fiction that only two students were sexually assaulted last year is emblematic of the larger problem. If U of T gets to claim that only two sexual assaults happened on campus last year, then the university gets to claim that there isn’t a problem with sexual assault on campus. Do you know a student who was sexually assaulted while at U of T? If you don’t, ask your female friends. They do. It’s often said that the first step in changing the discussion around sexual assault is to talk about it. So please, let’s start talking about it. Zane Schwartz is a fourth-year student who writes for The Globe and Mail and Maclean’s. He was The Varsity‘s news editor last year. Correction: An earlier version of this article used the figure 57,795 as the current enrolment at U of T St. George. This figure is the current year’s enrolment whereas this article references last year’s total enrolment (2013-2014) which is 51,203. Additionally, the phrase “victim’s advocacy organization” has been replaced by the more accurate, “victim’s advocate” which is currently being used in the United States as part of the advocacy campaign mentioned in the article. All errors occurred during the editing process.